Shola called up for Nigeria friendly. | NUFC Blog. Shola called up for Nigeria friendly. Newcastle United centre forward, Shola Ameobi, has been called up to be part of a twenty man squad to face Guatemala in a friendly match on February 9. This will be around the time that Newcastle United will be facing a home games with Arsenal (on the 5th), and an away match with Blackburn on the 12th. 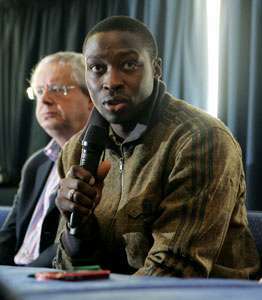 Shola has already represnted England at under 21 level 20 times, scoring 7 goals. But he is also eligible to play for the country of his birth, which he left to move to Newcastle at the age of five. Nigerian FA chiefs attempted to call him up to represent Nigeria some time ago, but it was only during the run up to the last world cup in 2010 that Shola expressed his desire to turn out for the “Super Eagles” of Nigeria. Meanwhile, one noticeable absentee from the current Nigeria line up is former Newcastle United striker, Obafemi Martins. Congratulations to the “Fenham Eusebio”, but here’s hoping that he doesn’t pick up any injuries on his travels, or that any other from the Newcastle frontline do either at that time. any more news about bothroyd or any1 coming lads??? If we have to pay 2m for Bothroyd, I think we should use that money plus 3-4m to buy Kranjar. Far better deal. I think we’re second to none with this attacking line up. Webbo – Victor Moses was someone who we looked at in the championship. Decent player, but not proven in the PL. Might be worth a punt if he is cheap enough. However, it’s all very well buying up young talent that have something to prove, but you need to temper that with experience. They must be fcking desperate. Non of our signings are proven in the PL, that’s why their cheap. Congratulations to the lad for getting an international call-up. Can only be good for NUFC’s image in Nigeria. But man have Nigeria fallen, they used to be a great international side, obviously not any more.